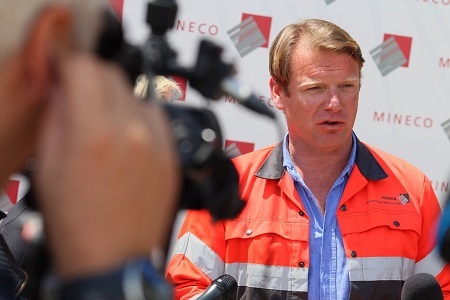 British company MINECO officially opened the lead mine at Olovo in Bosnia and Herzegovina today. It is the first new metal mine in BiH for 30 years and the only underground one in the country, and the best global mining technology and practices will be applied here. At the official ceremony in Olovo, the start of underground lead mining was officialised. Six years after the concession was granted, with over 40 permits and more than six million euros of investment, the British MINECO Group today employs around 120 staff. MINECO Group’s Chief Operating Officer Dominic Roberts said that all this would not have been possible without close cooperation with the responsible ministries and institutions, and a common desire for this investment to succeed. He also observed that the best in global practice and modern technology will be used in this mine, which will enable the mine to be a safe workplace with no damage to lives. “This is the safest mine in Bosnia and Herzegovina; we have set the standards for the further development of mining in BiH”, said Roberts. 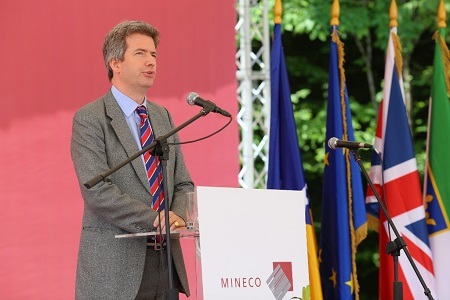 By opening the new mine in BiH, the British company MINECO is continuing its growth and development, as it began test production in 2017 at Bosilegrad in Serbia in another completely new metal mine in the Western Balkan region. Bosil-Metal became the first fully built underground mine in Serbia in the last 40 years. Besides Bosil-Metal, the British company Mineco and its partners own two more lead and zinc mines in Serbia – the mines at Gornji Milanovac and Veliki Majdan. Besides the Olovo mine, Mineco is the majority owner of the Gross lead and zinc mine in BiH and the antimony mine at Novo Goražde where it carries out research. At Čelebići near Foča, research has been successful and a study on ore reserves has been certified.